CA is 770 miles long and 250 miles wide, with 12.5% (1/8th) of the US population at 40 million. Approximate equivalent length distance: Montana / Canadian border to Colorado / NM border, St Davidson, Maine to Northfolk, VA, or Northfolk VA to 1/3 the way west across AR or MO. Californians drive everywhere, because, once you get somewhere, there's no subway or commuter train to get around your destination. (Exceptions are Bart light rail in SF area and some light rail in part of Los Angeles.) LA and SF voted yes for HSR and the rest of Ca voted no. But everyone agrees we need to do something about available water. Speaking about water, this morning we found out the 2 year old hot water heater failed. The thermo-coupler thingy. It was still under warranty so GE is sending a new part. Bad thing is it won't be here until Wednesday!! Tonight I looked in my Prepper supply box and found this!!! @boffer wrote: Sig, I saw a large scale CA farmer interviewed last night. He said that when he converted from flood irrigation to drip irrigation, his water consumption dropped 40% and his yield increased 30%. Good thing the switch worked as he had over $50,000 invested in the drip system. I forget the varieties of crops that he has in rotation, but he classified them as Mediterranean, meaning they like lots of heat, but that a good rain would wipe them out. That's such an odd concept for those of us with web feet, and those in various parts of the country doing a rain dance every day! Sanderson, where do the helicopters get the water? Is it ocean water? Are there any desalination plants in CA? @CapeCoddess wrote: ...Are there any desalination plants in CA? Just last night, in the news series I mentioned above, they toured the largest desalination plant in the western hemisphere that is being built near San Diego; it is scheduled to go online next year. CC, I'm only familiar with my area of Ca. There are lakes in the eastern Sierra Nevada foothills and mountains from which to collect fire water. Maybe they use ocean water on the coast? Boffer, Didn't know they had it built. It's so expensive that it would only be worth it for wealthy cost base areas, such as San Diego, and only in severe drought times. I don't know where they will dispose of the contaminated salts. The marine life is so fragile that it will be interesting to see the impact on the micro- and mini- flora and fauna which in turn affects the big things. I'm afraid that because of the costs, it will be gov't subsidized, like the high speed rail will be and Amtrak is. CA already has staggering state and local taxes. 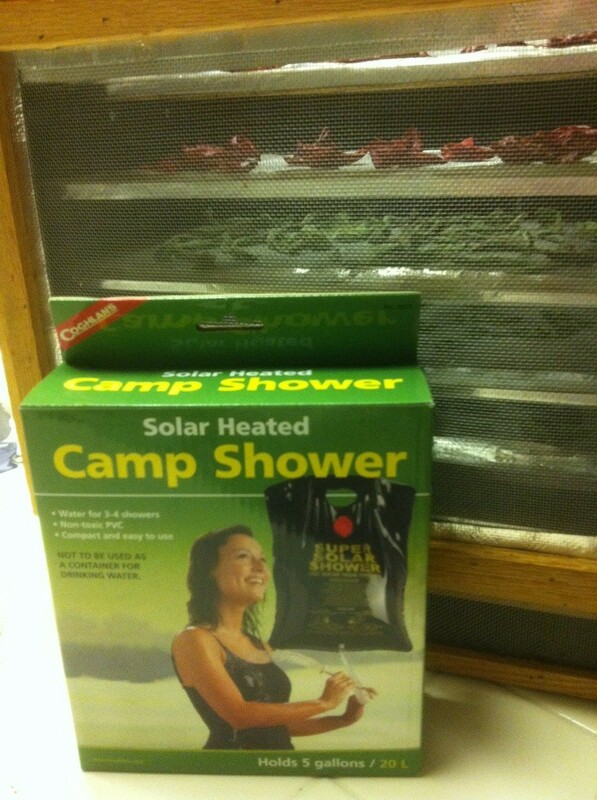 PS: it's kind of fun living a little "off the grid" with my solar hot water bag, sun dehydrator boxes, and veggies! The plant manager said that costs have decreased to the point where it's possible to make a small profit. He said the energy costs to operate are high, but that the water system currently in operation, also uses quite a bit of power for all the required pumping stations it takes to move the water. He said that given the drought circumstances, desalination has become price competitive, and if the drought continues, it could become cheaper than the system in place. He also asked: who has a better alternative. First, they remove the contaminants. He didn't say what they do with them. Second, they remove the salt and put it back in the ocean. I too wonder what that will do to the ecological system. Being that the plant manager was promoting (advertising) the plant facility, everything he said should be taken with a grain of salt. Re government subsidies, a lot of them are the basis for an advanced economy. An example is the federal highway system, vastly expanded under a Republican, Eisenhower, and the PWA, instituted under Roosevelt and responsible for bridges that are still being used and remain vital to commerce 80 years later and will almost certainly remain so for the forseeable future. Investing in the future always costs money, but it can return money too. Investing in nothing gives a zero percent return. Re returning the salt to the ocean, it seems to me that the damage that might be done would be a matter of where and how widely that salt were redistributed. All the water consumed by all the people that might use the water from that plant is a trickle compared to the size of the ocean itself, and therefore the salt content must similarly be a very tiny percentage of the salt in the oceans. Still, dumped all in once place, it could create a dead zone. It's hard to imagine that problem wouldn't be worked out in advance, but it's the nature of businesses to externalize their costs by ignoring as many of their true costs, including environmental costs, as possible. I hope those costs aren't pushed off into small areas of the ocean that excess salt can readily kill off, but it wouldn't be the first time humanity has gotten it wrong on purpose. I'd bet that the environmental analyses required to build a plant such as this one would prohibit anything very destructive resulting. "San Diego County is better suited than any large California community for desalination. It receives only 10 inches of rain a year, one-third less than Los Angeles, Fresno or San Jose." Fresno has a 10" average rainfall. This year it is around 6" to date. 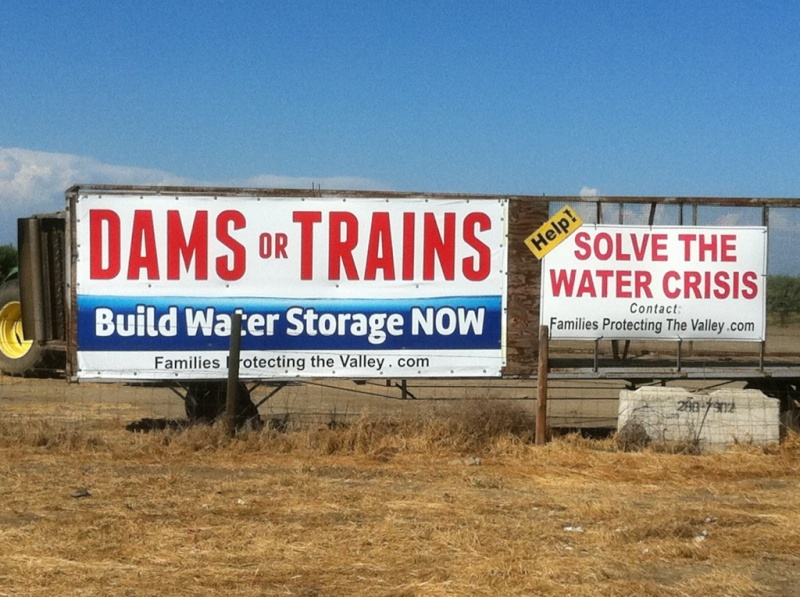 'The high price is worth it to help San Diego and other regions rely less on water from the Colorado River and the Sacramento-San Joaquin River Delta, both of which are overdrawn and increasingly unreliable"
In the article it mentioned another plant that now is now out of operation. De-sal plants may make financial sense in the drought cycles. Marc, If Gov't monies are needed, my vote is on water storage, better pumping stations and extending our regular train tracks, than high speed rail and de-sal stations. To take Amtrak from Fresno to Sacramento, you have to get off the train in Stockton and they put you on a bus for the last 30 minutes. To travel from Fresno to LA, likewise. A bus at Bakersfield to get over the Tehachipi mountains. There's a separate southern coastal Amtrak from San Diego to San Luis Obispo. It would be nice to have the 2 connect. Re pumping stations, I like that water taken from the ocean is a renewable resource. The ocean's not going anywhere. But our aquifers are in very serious trouble all over the world. Just pumping more and more out of an already limited and declining resource seems like a short-term solution to a long-term problem. I'm for trains almost anywhere, as long as they serve a serious population or industrial base. The subways in L.A. were an enormous boon to the limited sections of the city they were put into, and will continue delivering a lot of value to the local citizenry -- and to the environment -- for probably more than a century to come, to judge by how long the subways in other major cities and other countries have lasted. Cars cars and more cars make California traffic and pollution a time-consuming, energy-guzzling nightmare. Finding a parking spot can turn into a half-hour affair. It seems to take only a couple of years for the traffic to get noticeably worse each time. Already "rush hour" traffic levels last almost all day. How much worse can it get? L.A.'s public transportation system is so miserable. There will always be dispute over exactly where to lay the lines, but it seems obvious to me that what at least the bigger cities in Southern California need is a system that's pervasive. And to whatever extent that happens, it will free up huge amounts of money that people presently have to spend on gas, car repairs, insurance, and street maintenance. I'd love to see that kind of money regularly pumped back into the economy rather than turned into carbon dioxide, lost hours of life, and road rage. A desal plant is in the makings now in the Monterey bay. When it goes on line our rates will triple. Just today I received a letter in the mail that our CalAm (our corporate water provider) is seeking a 29% increase because voluntary water conservation is resulting in a loss of revenue. Poor guys; they are already posting a 40% return on investment, and have a 35% overhead cost of operating- now they want us to help keep the investors feeding at the trough. L.A.'s DWP tried to do the same thing some year back, but faced too much political opposition to their plans to increase rates no matter what people did and what price oil was at. Sounds like your politicians and utilities may be even more corrupt than ours were, if they actually get away with it. Thunder and lightening. Big splats of dirty raindrops falling!! Wasn't expected until Monday if at all. 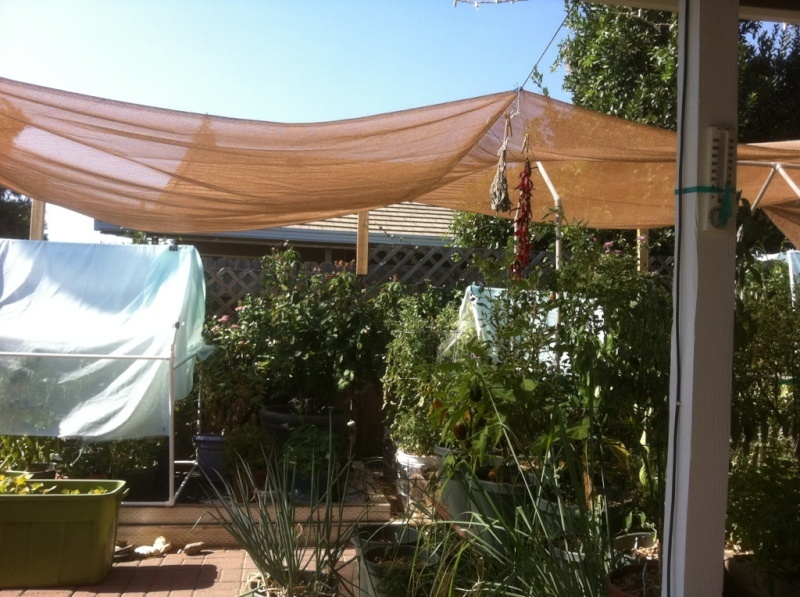 Probably 0.01" I took down the big cotton shade cloth because it can get really heavy if wet. If the El Nino forecast is correct, there should be quite a bit of rain in California this winter! I sure hope it's heading this way. Yardslave, how many 40 gal cans do you have? Hurray for the Californians! I hope you have to Google "Ark Construction" in the next few weeks. Or, at least you will get some water in all the reservoirs. You should have a very rainy winter with one of the strongest El Ninos in years. Maybe a tabletop can be emptied and re-purposed as an ark should the heavens continue to rain down. Rain!! Huzzay!! More to you soon hopefully. It's worth the nasties on the veggies. San Mateo (coastal just south of SF) 70s and 80s- lucky folks! The coastal towns often get cool morning and evening fog when the Valley is boiling, so folks flock to Monterrey and Pismo [75*F] for relief. With the drought and the soaring heat this week, the basic drip system in my area is tears. I've had to erect sun blocking shade screens because the tomatoes are stressed so bad they aren't pushing blossoms, and the fruit is showing areas of sun scald. I've planted only 2 of 10 beds to conserve and the local water provider/monopolist is asking the PUC to give them a 12% rate increase to make up for their PROJECTED loss of revenue- got to keep the numbers up for the investors. Where have all the reainmakers gone? I'm rain dancing! My husband just mowed the back yard and created a dust storm. Cat and I ran back inside. My new 75% blocking shade from Home Depot. I had made some muslin shades but they were so heavy. I took them down the last rain because I thought the rivets would pull out with the weight.